You will find summer to be a very welcome season once you have bore the brunt of winter. It is a time to rework your body after enduring the cold season and its effects. Don’t think some people will welcome the hot season in the same manner you have embraced it. There are those who cry hard and wish it was cold. This is a pointer to some of the hottest villages on earth. There, very little goes on to signify presence of human life. In other hot areas, even animals find it hard to survive since the weather conditions are hostile. This article will examine ten such villages and the high temperatures you are most likely to encounter during your tour. It is hard to believe how life goes on in these places and you will only end up sympathizing with residents who are still struggling there. Does this place in the USA strike something weird in your mind? It signifies death which is reflected by the high temperatures predominant here. Even though it does not mean you will die once there, it is a way of showing that temperatures are not always good for visitors. This is the hottest place on earth and the driest in northern of America. 57°C is the highest temperature levels to have been recorded in this valley. You cannot deny that this place in Libya is hot because it sits at the heart of the Sahara Desert. The World Meteorological Organization had to intervene at some point after some records showed it was actually the hottest village in the globe. Subsequent studies showed the records to be untrue but it comes second in temperature levels. 56°C is the biggest mark of temperatures to have been recorded at the village which looks more deserted. This place is also in Libya and competes for the award of the hottest place. This oasis town has a population reaching 10,000 people and the number is decreasing every year. People are finding it hard living there since there is nothing productive they can do. To show proof that it’s slowly slipping into an attraction sight rather than a habitable village, UNESCO has already moved in and declared some of its sections to be a world heritage site. The future of the village that has registered highest temperature levels of 55°C looks gloomy. Still in North Africa, this town is in Tunisia and is not spared by the harsh climatic conditions of the Sahara. It is among the few old towns still standing strong in the country with evidence showing that its one of the earliest places to have been habited. There are even records to show that its existence dates back 200,000 years with a high of 55°C temperatures being recorded. This largely deserted village in Mali is very hot with high temperatures reaching up to 54.5°C. Ironically, it is an administrative unit of the country, yet it looks to be lifeless. It is located on the northern end of the River Niger but its proximity to the Sahara makes it very hot. There has been repeated conflict and violence in this town just like most parts of the country making the situation even worse. The population there as of 2009 stood at 54,000, but it keeps on declining as people flee from the hot weather. Also in Mali there is this little village that people have found hard to live in due to extreme temperatures. The only features at the village to show that people might have been living there are three mosques. At the moment, 300 people are recorded to be living in this village that once recorded highest temperatures of 54.5°C. In Israel, you will come across this village that people ran away from due to high temperatures. It’s located near the border of Jordan and Israel with less than a thousand people living there. You will see a factory operated here to process meat but its business is always very poor. Dates are also grown in this village with about 18,000 trees. Its highest temperature of 53.7°C was also the highest to have ever been recorded in the whole of Asian continent. This one is in Iran and sits on the banks of the River Karun which allows people to do some minor farming. The population is very high at 1,425,891 but climatic conditions are generally desert-like. Summers are usually very long and extremely hot characterized by dust storms as well as sand storms. The World Health Organization has already raised alarm over the high rate of air pollution taking place in the village that once recorded temperatures of 53.5°C. This is again in Iran and one of the hottest places. It is the capital of the Aghajari District that was very active and lively in the 80s. At the time, there was a population of around 65,000 people but the number has gone down significantly owing to increasing temperatures. Another factor that contributed to this village being deserted was the ravaging war between Iran and Iraq which inflicted fear among locals. The highest level of temperatures ever recorded at this village was 53.3°C and it has not become any better today. This is a Sudanese village that is very hot for locals and visitors. It is in the northern parts of the country on the shores of Lake Nasser and close to the Sahara Desert. 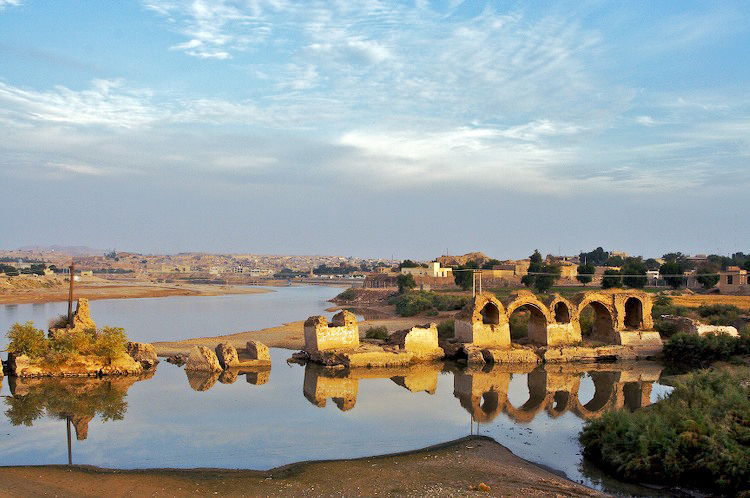 Disaster struck in 1971 when Aswan High Dam broke its banks to create the lake. It led to the displacement of many people who were relocated to the desert and others died of diseases like malaria. From the initial population of 50,000 people, very few remain there today with the highest temperatures ever recording hitting the 52.8°C mark.